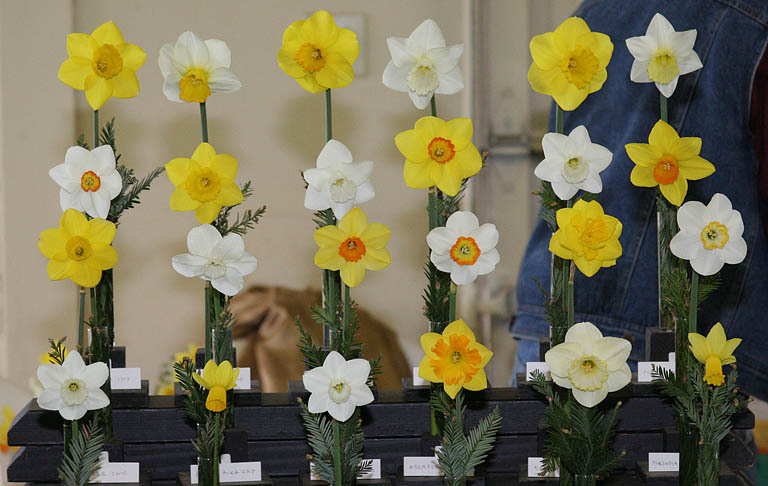 Below are the results of 31st Annual Daffodil Show “Waltz of the Daffodils“ hosted by the Fortuna Garden Club on March 25th & 26th. Top row is Little Becky 12Y-Y, Hummingbird 6Y-Y, Bruce Irwin BDP 15/95 8W-W, and Fenben 7Y-Y. 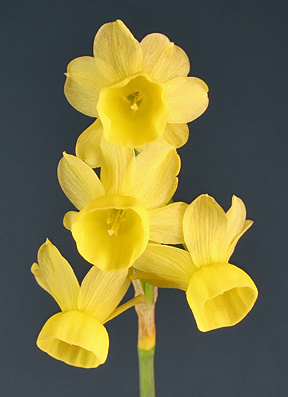 and N. bulbocodium conspicuus 13Y-Y. Front row is Towai 12Y-Y, Norwester 6Y-Y, N. cuatrecasassii var. segimonensis 13Y-Y, and Sabrosa 7Y-Y. At the bottom of this report are comments from Kirby Fong, Show Chairman and Bob Spotts, President. 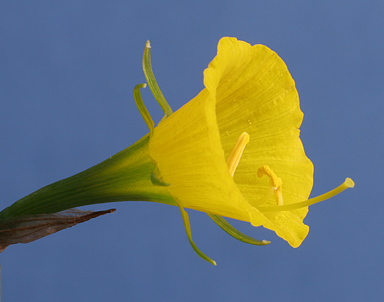 MINI GOLD RIBBON- Koopowitz & Howe – N. bulbocodium var. The weather in my area of California has been unusual this year. It was warmer than normal in early February and colder than normal since mid-February. I credit the coolness for the low 90s (points) whites I got this year as opposed to the usual unexhibitable whites. Those of you in the colder parts of the U.S. (almost everywhere except the deep South) may snicker when I tell you we’ve had to put up with overnight lows of about 35 degrees Fahrenheit and daytime highs of about 55 degrees. This plus a lot of rain means we’ve had weather approaching Oregon’s, but not close enough to produce really superb whites. 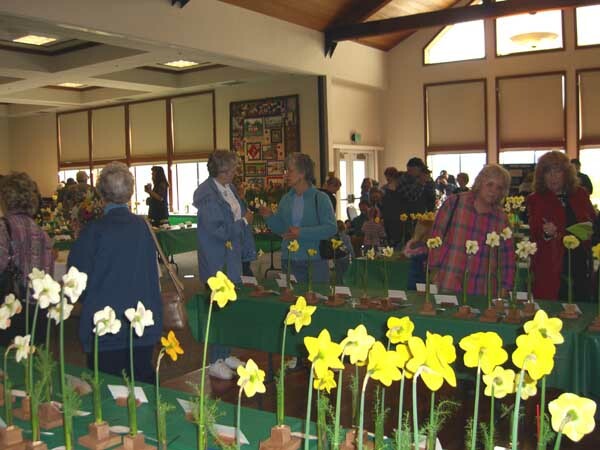 Anyway, with the later season and the rain and wind beating up the flowers, we had a smaller show at Livermore this year than last. The quality of the survivors was up because the cooler growing conditions meant flowers opened more slowly and did not have as many mitten thumbs. The regional show cycles through the Pacific Region moving south to north, and this year it was Livermore’s turn. 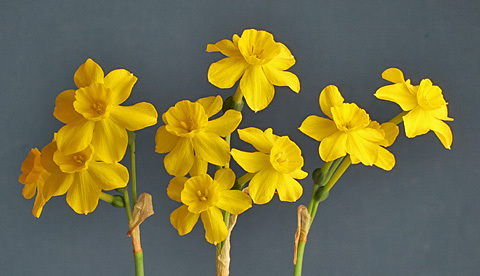 In the last seventeen years of showing daffodils, this was the second time I’ve had enough good flowers to stage a Tuggle (bronze ribbon) collection. The other time it was not our turn to be the regional show. I was also able to stage a Quinn Collection. So you can get at most two blue ribbons for 60 flowers. I suppose one compensation is you have to fill out only two entry tags. Some of Janis Ruksans’ cultivars were doing pretty well this year, so I deliberately used them in my Quinn. You can recognize them by their Latvian names. 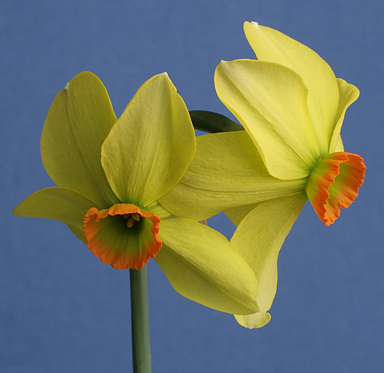 The catalogue was unclear on the classification of Caka Zieds (an unregistered cultivar) so I classified it as it looks. It’s perianth is on the creamy side, so it does not really look as impressive as Sunny Ring which Cincinnati convention attendees saw in Mary Lou Gripshover’s front yard. We had slightly more than one table’s worth of daffodils in containers, so this mass of leaves and flowers made an impressive display. Another unusual aspect of the show as how many good miniature seedlings we had. The vote for Mini Rose ribbon winner was not easy because there were so many good candidates. I didn’t photograph the array, but a couple other people did. The weather during the week before the show was typical of Oregon, not California. It was sleeting lightly here in Oakley as I left on Friday afternoon with my flowers for the 45-minute drive to Livermore. The cold weather was perfect for a show! The flowers would keep beautifully in the show room at the Nursery. Arriving at Alden Lane Nursery, the show room was already readied by Nursery staff with tables in place. 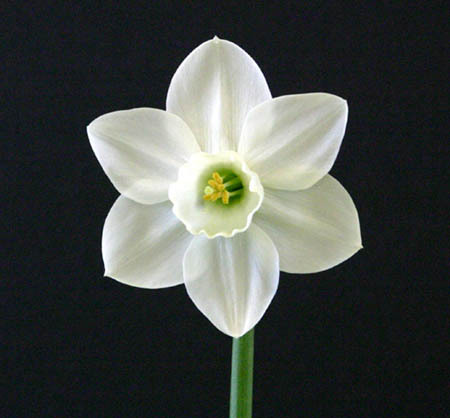 The box of Mitsch flowers for commercial display was waiting – FedEx’ed from Oregon. My first task was to get the stems into water. Soon Kirby Fong, Jon Kawaguchi, Anna Rawls, Anna Fine, and David Oakley arrived. We had the show room set up in no time. Rosemary Scholz drove all the way from Escalon to deliver flowers for arrangers. Sid DuBose had picked the blooms from his field in Stockton. The Oregon-ish weather had allowed blooms to open slowly and the outcome was blooms of especially high quality. 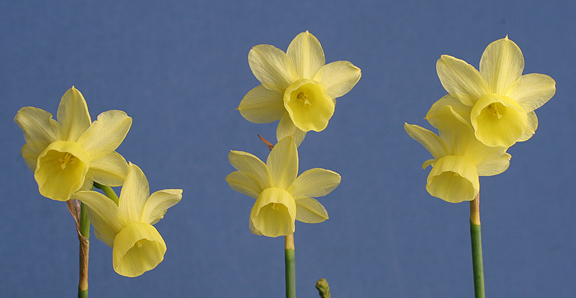 The occasional hail and brisk winds did make it necessary to cut blooms daily and refrigerate them for the show. Kirby and I cut and kept blooms in good condition for two weeks. 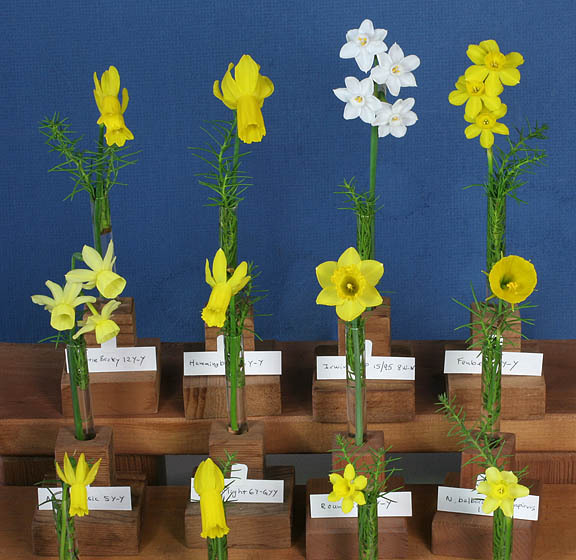 Kirby exhibited his many of his best blooms in two large collections: twelve different vases of three blooms in the “Tuggle Award” and 24 different blooms in the “Quinn Award.” 60 blooms required for two ribbons! The Tuggle Award is only offered at the Pacific Regional Show. This designation rotates annually among the six shows held on the West Coast, so the opportunity to compete for this award comes about infrequently. Kirby’s win got him a most attractive medallion. 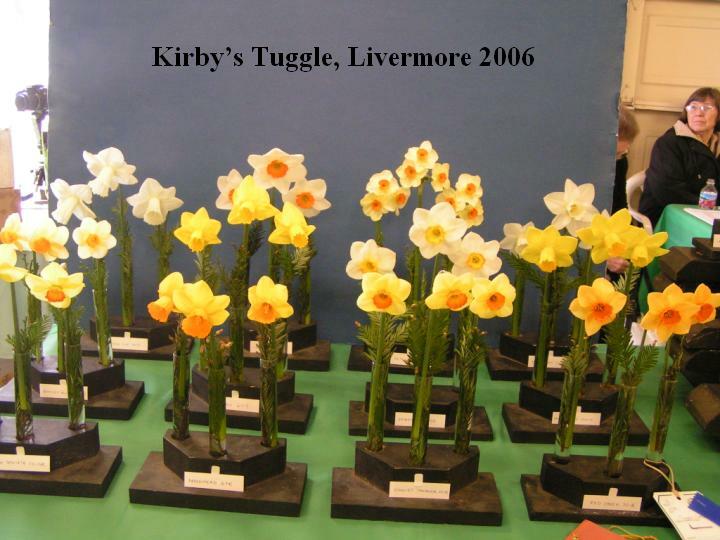 Even having used all those flowers for two blue ribbons, Kirby amassed 41 blue ribbons – easily the most in the show. 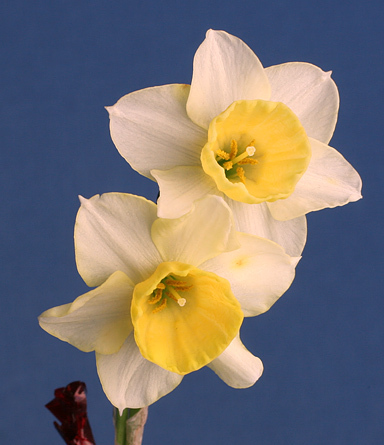 Harold Koopowitz and Marilynn Howe brought blooms from Santa Ana, south of Los Angeles. A long drive, including just beating a snowstorm that delayed traffic over the Grapevine. 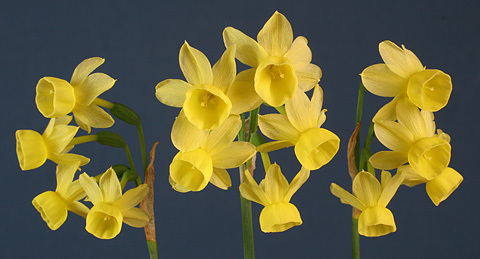 They specialize in breeding small flowers – Miniatures and Intermediates. 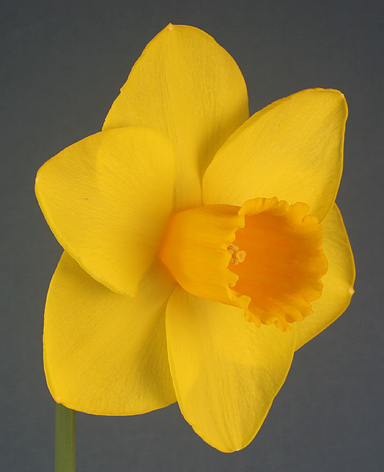 They use the species (wild daffodils which grow in Spain and Portugal) in their hybridizing and their seedlings are unique. It is always exciting to see what they have created. Harold and Marilynn won Best Miniature among many other awards. 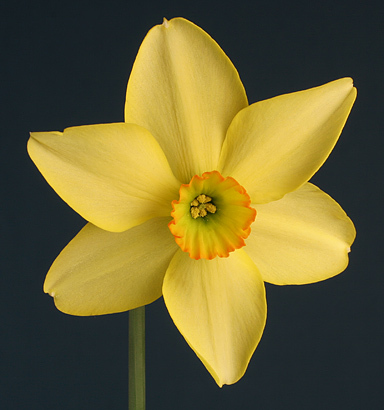 You must visit the NCDS website and look at their marvelous blooms. My own seedlings loved the cool and wet Spring. 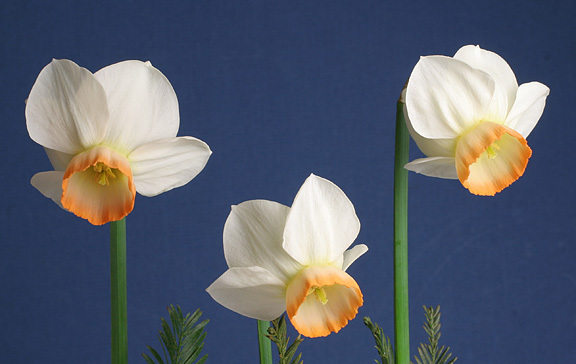 I did well with them in the show, winning Best Standard in Show with one so unusual that the Judges were captivated and overlooked other blooms that had better show form. No matter, I liked that bloom the best, too. Take a look at it on the website. It is unique. 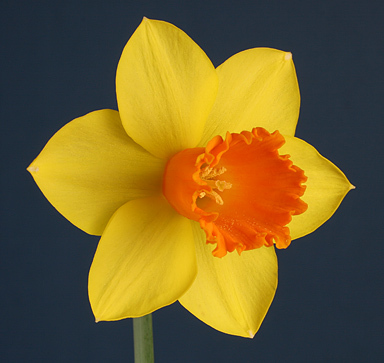 A highlight for me was having a container (pot) of Mesa Verde – the green daffodil – in full bloom for the show. It made quite a hit with show visitors. The show was of good size (636 blooms); what was most encouraging was that there were 18 exhibitors! Next year, adding you we’ll have even more, won’t we! We played to good crowds in spite of intermittent downpours outside. Still, the weekend success was greatly enhanced by the good times spent with friends! In addition to those mentioned above, there were Peggy Oberg (all the way from Los Angeles), Steve Vinisky (from Portland! ), Debbie and Crawford Pratt, Melissa Reading and John Castor, Jacque Baclace, Nancy Tackett and Ben Blake, Deva Lowenthal, George Perko and Phil Stanley, Betty Ford, and Mary Roach. Surely others too – for whose omission I apologize. Alden Lane Nursery was the perfect weekend host. Our every need was anticipated and met. Cookies and coffee magically appeared for the visitors and exhibitors. Kudos to Jacquie Courtright and all her most able, attentive staff members. Below are comments about this show by Bob Spotts, NCDS President. 6-2-37, 8Y-O Matador x ? 6-2-36, 8Y-GYO Matador x ? It snowed in Murphys during the weekend of the Livermore Show, March 11-12. 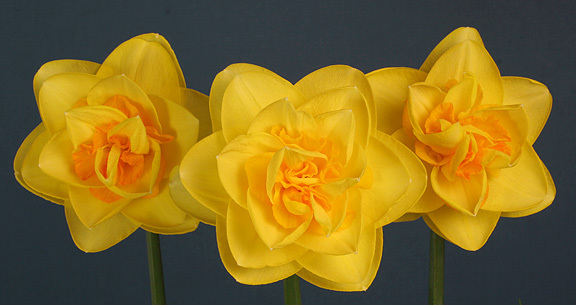 Unsettled weather continued during the week between shows and I envisioned a small show with high-quality blooms. This came only partly true. 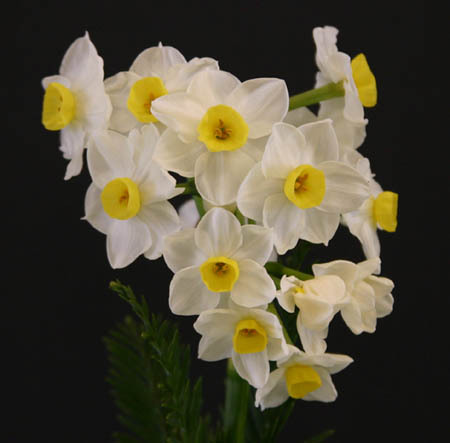 It was a big show (920 blooms) with high-quality blooms! There were crowds in the showroom almost all the time. Our Hospitality Table (Anna, Anna, Cynthia and others) were kept busy answering questions and dispersing information sheets on buying and growing daffodils. After a two-hour drive, I arrived at Ironstone Vineyards shortly after noon on Friday to help set up the show room. This year we were to be indoors instead of the working-floor Breezeway. When I arrived, Ironstone staff had been there first. I entered into the show room which was completely set up: tables appropriately arranged and clothed. The Mitsch Display box was waiting to be opened. Two Ironstone employees soon appeared to remove test-tube racks from their storage boxes and fill test tubes! Soon, other NCDS members arrived and things were humming! This show has an 11am opening on Saturday morning, so the majority of staging must be done Friday afternoon and evening. I find it hard to get my rhythm staging, but finally got underway. Several of us staged collections and vases of three until 11pm. Nancy Tackett and I returned at 6am Saturday (Ben Blake slept in). Others returned at a more civilized hour. Debbie and Crawford Pratt left their home in Los Altos about 5am, expecting to be at the show room by 7:30am to enter their blooms of Historics. Little did they (and Rosemary Scholz) know that the town of Murphys lay between the highway and Ironstone and at 6am would be sealed off to through traffic for the town’s “Irish Days” celebration. By the time they found a route through, it was nearly 9am – the announced time for judging to start. 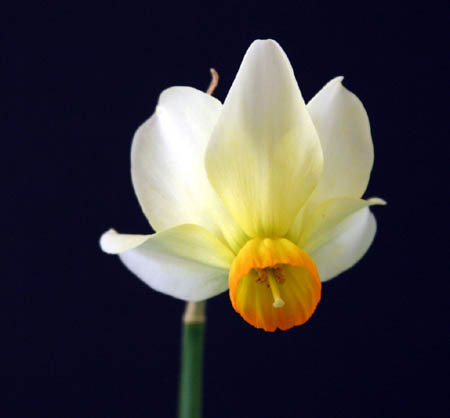 NCDS has a good philosophy: if a person is willing to bring blooms to the show, then those blooms will get into the show! Exhibitors who have finished with their own, and persons not having entries to make all pitched in to get all blooms into the show. 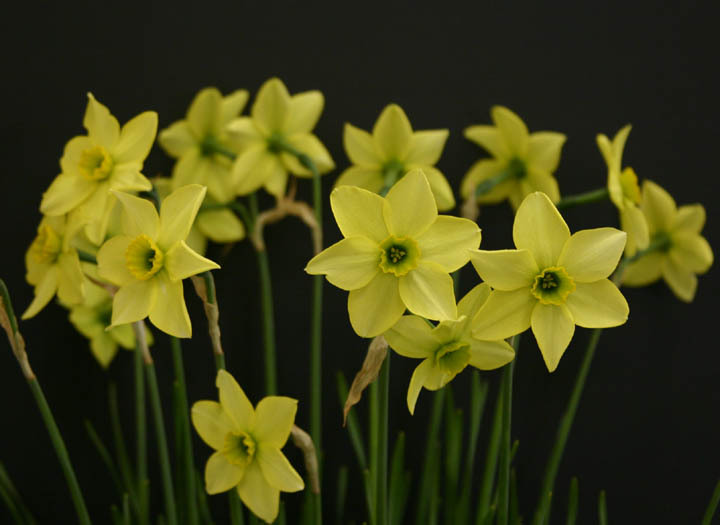 I was a recipient of such help – with many of my single-stem entries being staged and placed by volunteers. 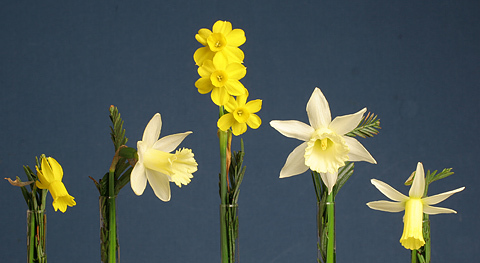 Likewise, Rosemary and Deb & Crawford were given special attention and their Historic blooms got into the show. Good thing too, because Historic blooms gained much public attention. 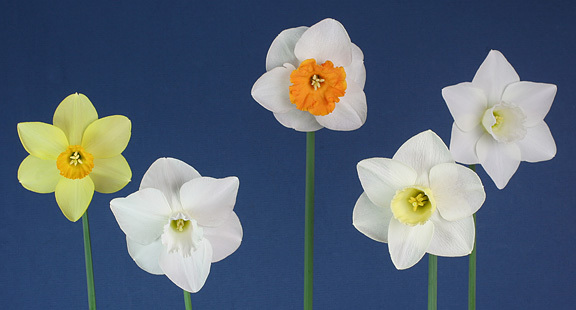 Many attendees could really relate to these – they’d grown up seeing these in their gardens! Blues were spread across 18 exhibitors. Veteran exhibitors, Kirby and I tied with 33 blues each. Other exhibitors made quite an impact, too: Rosemary Scholz won 13; Deb & Crawford Pratt 11; Rich & Jane Hunt 10; Melissa Reading 9; Faye & Jay Pengra (all the way from Los Angeles) 6; Rusty Rolleri 7; and Nancy Tackett & Ben Blake 6. There was competition among the Ironstone landscaping/gardening staff: Dawn Mellera topped the four persons entering with 6 blue ribbons! 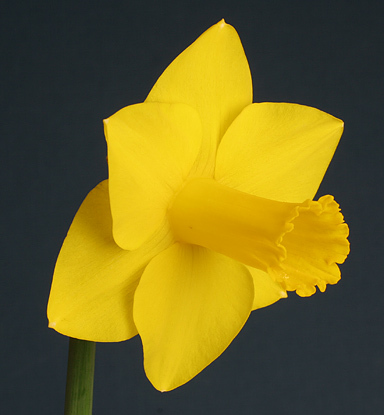 I won the Best Standard in Show with a seedling yellow trumpet. Very stately. 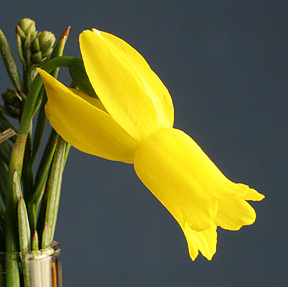 Kirby won the Best Miniature in Show with a tiny yellow bloom with swept-back (cyclamineus) form. A real cutie! 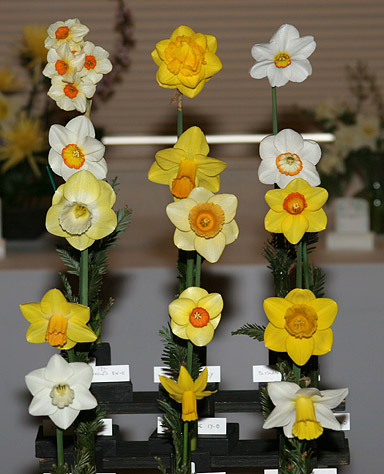 The show featured 18 entries of daffodils in containers – surely the most ever in an NCDS show. Containers provide a good opportunity for exhibitors. They can be taken home after the show and enjoyed until they fade. I get several weeks of bloom from each. Many NCDS members took the drive to Murphys even though they had no flowers. Dian & Mike Keesee from Fortuna; Peggy Oberg from Los Angeles; Jan Moyers from San Rafael; Deva Lowenthal & spouse from Oakland; Anna Rawls & daughter Cynthia Sternberg, Anna Fine, Doris Ryon and Jo Balch from Livermore are faces I remember. There were more and I apologize for forgetting you. Lyn Woishness, Ironstone Events Coordinator, assured preparations were perfect and periodically visited the show room to ask if anything more was needed. Special kudos go to Ironstone’s Chris Gomez and Larry Ringland without whose quiet and steady support our show would founder. 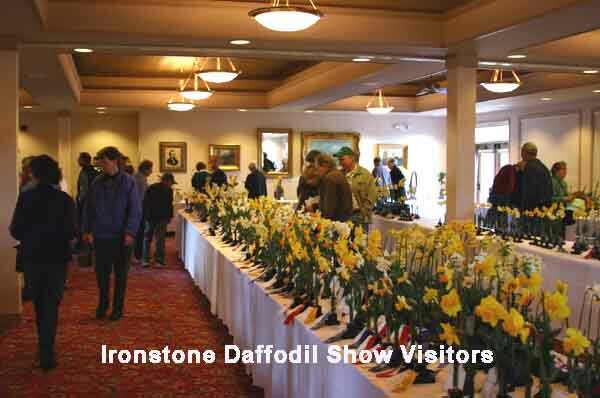 Ironstone’s immense areas of naturalized daffodils were in full bloom – despite the fact that they had been under 6″ of snow a week earlier. Splendid and spectacular! Enjoy the show results accompanied with photos of flowers, venues, and guests.